During hot summer days this cold treat is a real refreshment and invigoration of the entire organism. We opted for homemade mint ice cream out of several reasons: it is cheap (most foods you already have at home), it is healthy and good for the bones, also does not harm our teeth (by far this is a better choice than buying ice cream), and tested it improves mood (raises the levels of serotonin). This inexpensive summer delicacy leaves no one indifferent, almost all like it immediately. Read on how to make ice cream at home. As we have already said in the introduction, most of the ingredients for homemade ice cream you already have at home, you may only run short on 2 dl of coconut milk, but today it is available almost everywhere - from supermarkets to health food stores. This is best known by people who are intolerant to lactose because these foods are very useful in the daily diet, because they do not cause any problems. Yet in this recipe, we have 0.5 L of regular milk, so take notice of that, if you are planning to make this a treat. You can further customize the recipe. 50 g of chocolate slices. How do you make homemade mint ice cream in 5 steps? Wash mint leaves, and soak in milk, and let it briefly boil on medium heat, then leave it to cool for about an hour. Strain the milk then wash the mint leaves and return it to milk, and warm it up shortly while preparing the mixture of egg yolks. Put the chocolate in the freezer to harden, for easier cutting. Meanwhile, beat the egg yolks with sugar, vanilla and salt until the mixture is compact. Then in this slowly pour the boiling milk. Then transfer the mixture into a saucepan and warm up a few minutes on medium heat until it thickens, it should remain below the boiling point). Leave it to cool and place in freezer. Every hour to hour and a half take the homemade ice cream and mix it for about ten minutes - so it will be more compact. Let it stand for several hours before serving. When the mixture is squeezed, prepare the chocolate which you inserted in the freezer. Cut with a knife into thin sheets and stir it into an ice-cream with a mixer. Add the chocolate only in this later stage, it will ensure that it does not unite fully with the mix. Repeat the process of mixing until you get the desired density and texture of ice cream. Then put this treat in the freezer for an additional two hours before serving. If you use a spoon for ice cream before serving dip it in boiling water to help remove the ice-cream easier. 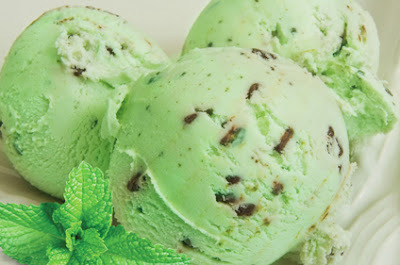 Homemade ice cream decorate with chocolate or mint leaves of your choice. We hope that you will like this recipe for homemade mint ice cream, and that you will in the summer months often prepare it in your household. Saving ice cream can be very fun, especially for the children, be sure to include them in any way in this process. My little helpers were very helpful, several times now. Enjoy!